How bitJob is reshaping the homeowner and rental insurance industry for “lucky” students with Blockchain. There are many blockchain platforms out there but have you heard of bitJob? A decentralized peer-to-peer marketplace meant for the global student community, freelancers, and employers? Well, now you have. But that’s not the best part, they recently announced a collaboration with Lemonade, an insurance company operated and powered by behavioural economics and artificial intelligence (AI) that offers insurance to both renters and homeowners. You might be wondering “What are the benefits of this collaboration?” Well, by integrating the insurance API developed by Lemonade into the bitJob marketplace, students that already own a house will be able to get customized rates for homeowner and rental insurance, all at a simple click of a button. This collaboration between Lemonade’s Artificial Intelligence and bitJob’s Blockchain will make policy creation, quoting, and insurance policies for renters, condo, and homeowners, more user-friendly for the student community. bitJob was founded by three Israelis, and it gives students a chance to earn a stable and fast income at their leisure, which is something that was not available a few years back. The awesome part of this platform is that it is creating a student-based economy – a recently discovered consumer market – where students can easily cash out or spend their income within the marketplace, get products, services, and openings that adequately suits their way of life. It’s a common knowledge that employment has a recurring issue of demand and supply, and students are on the wrong end of the stick because they find it hard to secure professional business opportunities and often shy away from looking for high-profile jobs that can get them set for life after graduation. A decentralized payment system where payments are issued out by the platform using PayPal after the value of a service or product has been measured using cryptocurrencies. This invariably eliminates the need for third parties like exchange services and financial institutions. A decentralized marketplace for jobs where members of the platform can get involved in bidding processes or direct hiring. These can only be done by following rules and regulations set by both the participants and the platform. A peer-to-peer scholarship and lending market where companies and organisations in collaboration with bitJob, offer students on the platform student loans and other financial services. This allows the build-up of trust between both participants and bridges the gap between the next and current generation of talents. A modern consumer sector that unites over 500 million students where organisations can easily get access to visionary customers globally. 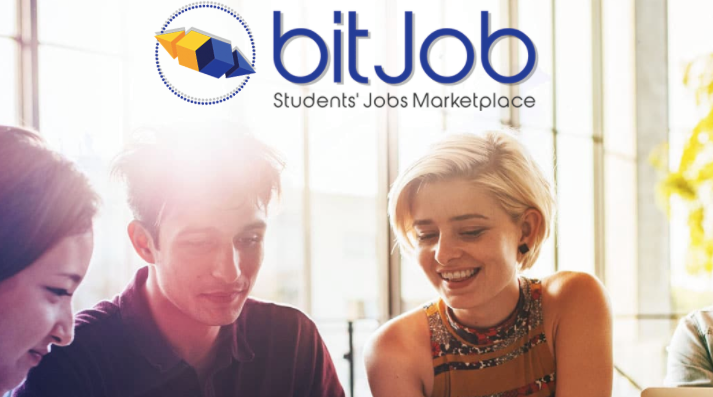 BitJob has discovered a new customer segment – students – and with their recent collaboration with Lemonade, they not only give students access to modern revenue models, they also get easy access to policy creation, quoting, and insurance policies. Which Cryptocurrency Trading Platform Is The Best?